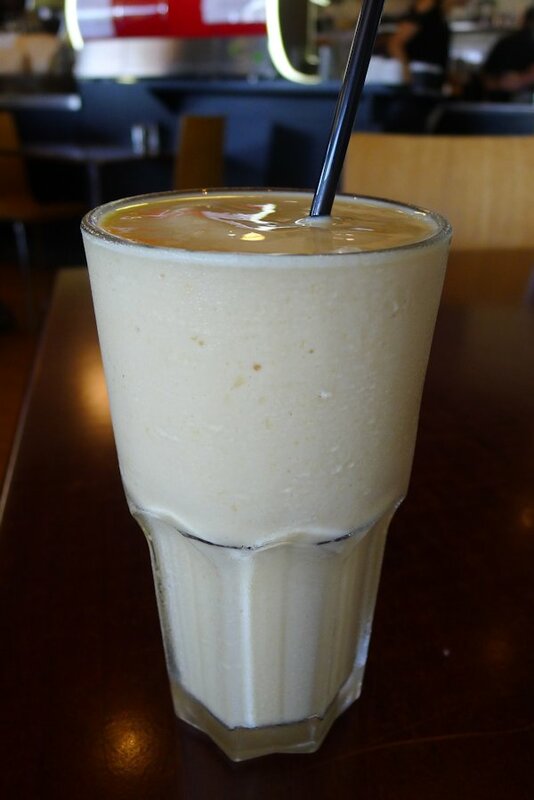 After neglecting Croydon for far too long, Café On Strand is our first review in the suburb! With no spare tables outside, we seated ourselves within. The interior is spacious but we found it far too loud and echoey. All it took was a passing ambulance for us to decide that we actually needed to move outside. Some deft timing and a shady spot was ours! The service was quick and no-fuss. There were no particular issues but neither was there anything standout that left an impression. 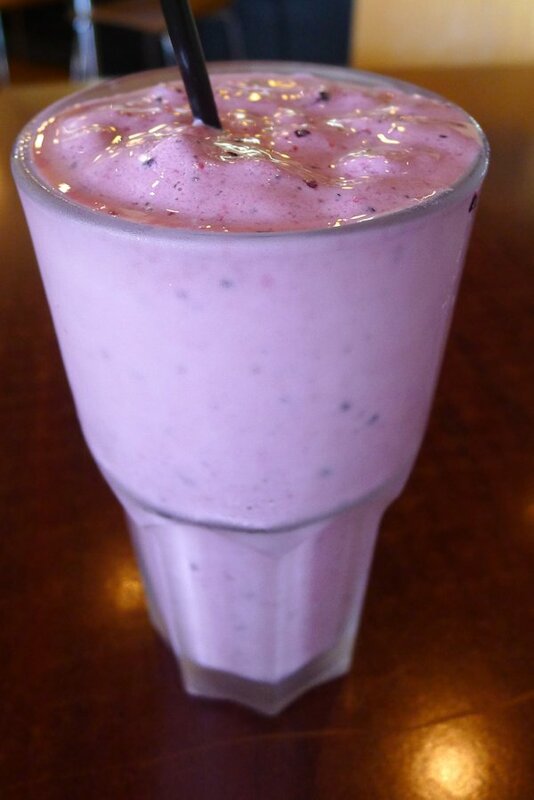 The cold beverage menu is quite expansive featuring milkshakes (chocolate, vanilla, strawberry, banana or caramel, $5.50), frappes (mango & pineapple or mint & mixed berry, $6.50) and fresh juice (regular $6, large $7.50). Our mango and mixed berry smoothies ($6) did not pack as much of a flavour punch as we were hoping but they were enjoyable nonetheless. CoS uses their own house blend of beans sourced from Brazil, Ethiopia and Indonesia. 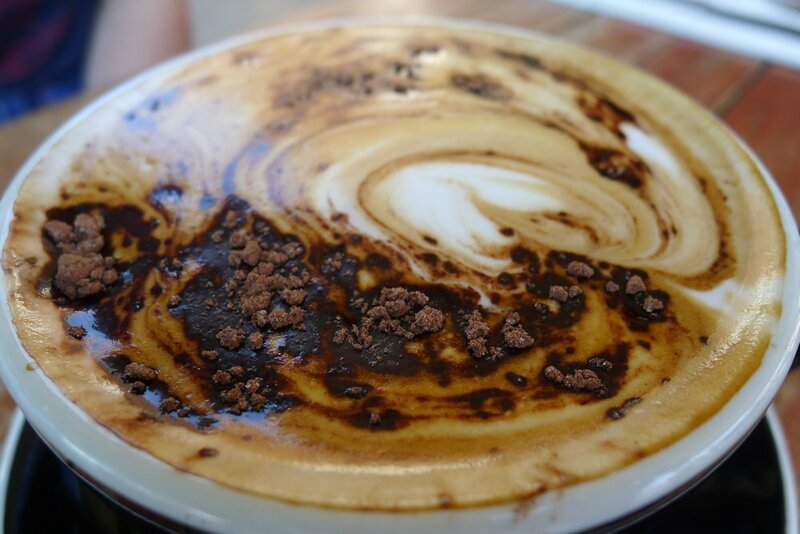 You can certainly taste and appreciate the unique flavours yet the coffee remains reasonably priced at $3.50. 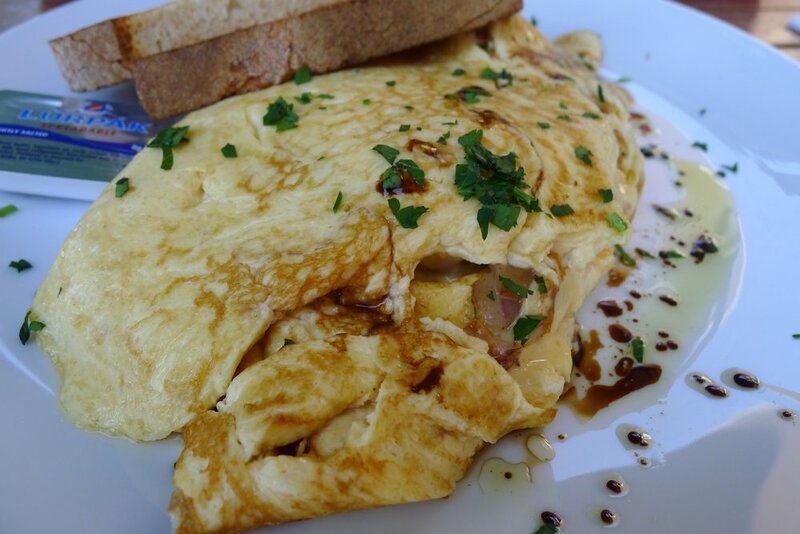 There is only one omelette ($14.50) on the menu but it has some great fillings. The all-important egg-to-filling ratio was almost right although inevitably some more of the latter is always appreciated! Bacon, cheddar cheese and tomato work well together and two slices of sourdough make this a filling and well priced meal. 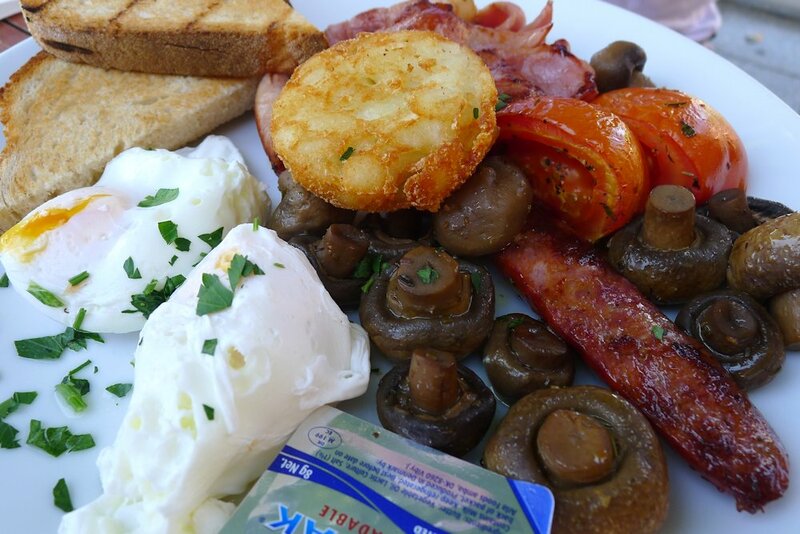 The behemoth of the menu, the big brekky ($19.50) is for those with big eyes or stomachs and comes with two eggs done any way, plenty of bacon, a mountain of mushrooms, chorizo, tomatoes, hash brown and toast. Pretty simply flavours here but all prepared reasonably well and with minimal oil on the plate which is always a plus! The bacon could have been a bit crispier though. The small brekky ($8.50) variant of this dish comes with one egg, one slice of bacon and one slice of toast. I ordered the pancakes ($13.50) by mistake… I had the French toast ($13.50) in my mind when I was ordering but I blurted out “pancakes” for some reason! 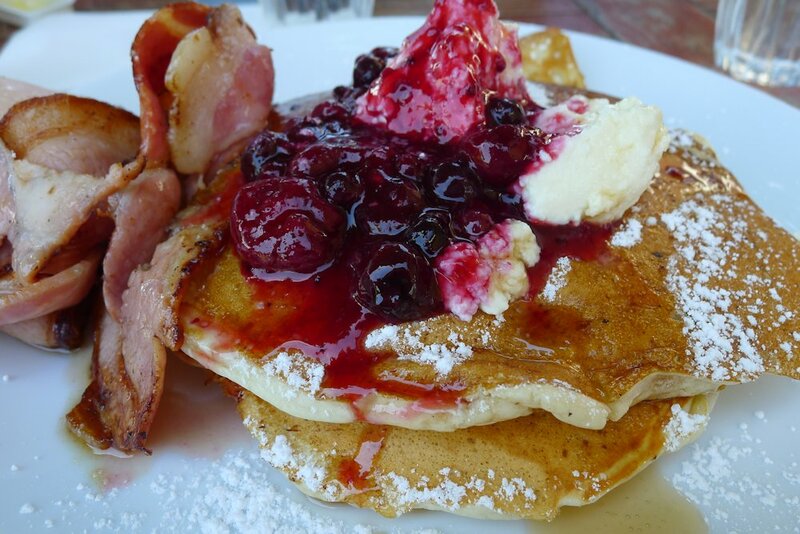 So instead of caramelised banana with maple syrup, I accompanied my side order of bacon ($3.50) with a stack of pancakes, ricotta and mixed berries. I’m glad that I did because it was a great dish, with a well-presented tower of fluffy pancakes. They tasted good especially after soaking up the juice from the compote. The menu is quite simple but has something for most people. Interestingly the eggs Benedict ($17.90) comes with salmon and spinach instead of ham which the name implies! Perhaps a change to “Florentine” or “Atlantic”. The vegie Benedict ($15.90) sounds a bit more inventive with thyme roasted mushrooms, roma tomatoes and spinach. You’ll also find corn fritters (rocket, poached egg and homemade tomato chutney, $14.30), the fruit plate ($15.90) and more but it was slightly disappointing to see lunch dishes on the specials menu but no breakfast dishes. While there wasn’t anything exciting or unique about Café On Strand, the dishes they serve are prepared well and the tables outside (and hidden courtyard through the back) are a great place to relax.. The coffee was excellent so if you’re in the area, make it your place to stop. 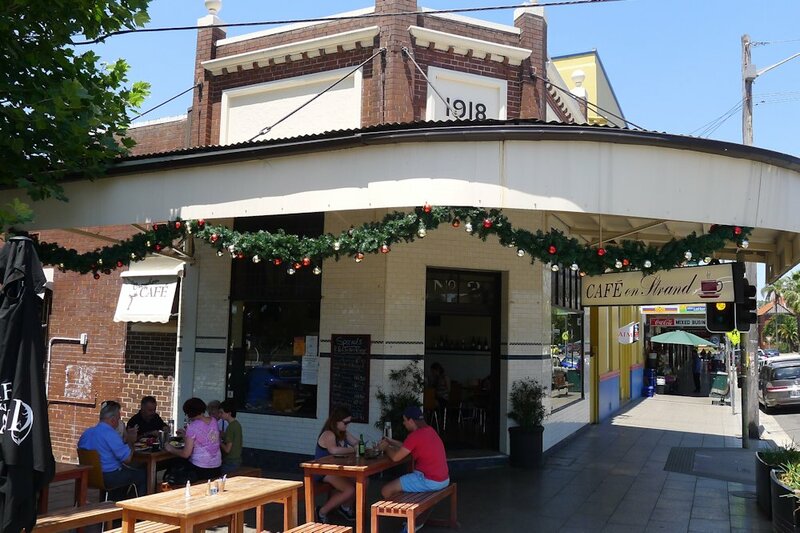 This entry was posted in Sydney - Western Suburbs and tagged Disabled access, Dog friendly, Fresh fruit and vegetable stores close by, Outdoor seating, Parking close by, Reasonable prices. Bookmark the permalink.